Tim Leberecht, CMO of design firm NBBJ, believes that we need more romance in our lives—and in business. He spoke at the MLOVEConFestival in June, and we had a chance to ask him about his forthcoming book, “The Business Romantic” (HarperCollins). Tim, in a nutshell, what is “The Business Romantic” about? The book’s main argument is that we underestimate the role of romance in our lives, and that we can find romance in and through business: by designing products, services, and experiences that enchant us and connect us with something greater than ourselves. It’s a story about falling in love with business, again and again, after the first thrill of a relationship—whether as start-up entrepreneur, employee, or follower of a brand—is gone. You write that you fear another “disenchantment of the world.” What do you mean by that? More than a hundred years ago, the German sociologist Max Weber bemoaned a “great disenchantment” as the result of industralization: to him, Taylorism, bureaucracy, secularization, and a belief in the supremacy of rationality formed the “iron cage” of the modern age. Today, in our hyper-connected times, I think we are facing another wave of disenchantment, another iron cage, this time caused and propelled by the pervasiveness of digital technology. We live in a time when science-fiction narratives can hardly catch up with the pace of technological advances, and neither can our cognitive and moral faculties. At the same time there appears to be a backlash against the datafication of our world that makes us increasingly reliant on services which measure, rate, analyze, and predict our behavior. We are slowly beginning to realize what we lose when we record everything and entrust machines to know us better than we know ourselves. We are only now realizing what we miss when we simply value that which we can measure. The onslaught of artificial intelligence, Big Data, and Quantified Self apps systematically eliminate uncertainty, serendipity, and surprise. I don’t know about you, but I don’t want to live in a merely algorithmic world where everything is explicit, where everything and everyone is completely predictable, with no room left for doubt, magic, and mystery—in other words: romance. Being romantic means being excessive, unreasonable at times, and even inconsistent. Romance is the doorway to sacred spaces, to our brightest and darkest experiences. Both are critical parts of our humanity, but we are in the process of engineering them out of our lives for the sake of a happy medium. Are you—and other “Business Romantics”—against technology? No, I’m not a Luddite, but I share with Evgeny Morozov, Douglas Rushkoff, Evan Selinger, Miriam Meckel, and other critics the concern about a myopic belief in technology as the sole metric of our lives. Technology is a means to an end, but it means nothing if it doesn’t serve the values that we as citizens, consumers, and human beings agree on. I’m worried that we increasingly outsource our humanity: there are now not only apps for doing pretty much all of our chores; there are also ones for “speed roommating,” reigniting romantic feelings amongst married couples, or even automated break-ups. If all of our memories, sentiments, and dreams are stored and analyzed, we will no longer be able to think “outside the cloud,” outside of algorithmic predictions, outside our recorded and projected intentions, our augmented quantified super-self. I believe we must protect what makes us human and fight against a narrowing of our playing-field where we are increasingly enmeshed by Filter Bubbles and live in a house of mirrors. If we subjugate all of our desires under the principles of convenience, radical transparency, and total knowledge, we will end up selling our souls. We must appreciate the unthinkable, the uncertain and unknown, the dark side of our dreams and desires. We need a healthy dose of discomfort because it is the friction, the discomfort that grants us meaning. I actually count on technology to deliver on that. I wish we had more poetic technology to open up spaces for imagination and tolerate the inexplicable rather than trying to minimize our personalities to patterns, and our actions to neurons. So romance is the answer? What makes it relevant in 2014? I believe we’re witnessing the beginning of a new romantic age. It is no surprise that recent books like Thrive, The Purpose Economy, Present Shock, or The Rise highlight the need for a new definition of value. We are in dire need of transcendence, of reconnecting to a sphere that, in the “second machine age,” seems buried underneath a flood of data as well as the corporate logic of ROI and profits, the “destructive destruction” (Douglas Rushkoff) of solipsistic start-ups and an economy that exponentially rewards exponential earnings. When I was doing research for my book, I met many Business Romantics: they are entrepreneurs and CEOs, but also hackers, corporate rebels, and other misfits who operate either on the fringes or at the heart of our knowledge economies. I realized that we are all craving romance, constantly. Not in the sense of polygamy at work or in our relationships, more in the sense of seeing the world with fresh eyes, and never giving up the need to find or create wonder. We’re all longing for a transcendent experience that’s so powerful precisely because it remains inexplicable. 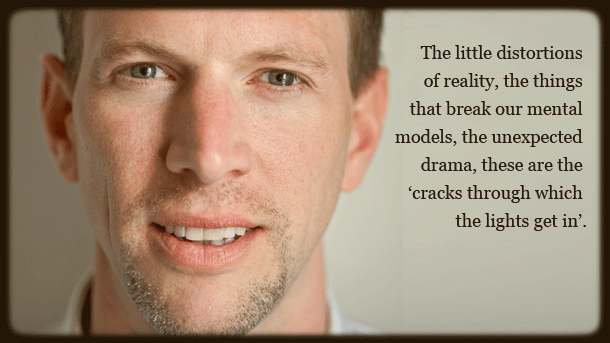 The little distortions of reality, the things that break our mental models (like chatting up a stranger during our commute), the unexpected drama, these are the “cracks through which the lights get in.” But in business we usually do everything to prevent these cracks, to avoid vulnerabilities and imperfections. We prefer thin over thick presence, but aim for thick, not thin skin. We minimize risk; we strive to be consistent, fully predictable, to be in control, anywhere, anytime. It doesn’t have to be like that though. Is the book some kind of lofty manifesto? I admit that writing about “business romanticism” was a bit like dancing to architecture, as the saying goes, but I hope that the book provides readers not only with a detailed account of the current shortcomings of business-as-usual, but also actionable recommendations for making their own customer and employee experiences as well as their careers more meaningful. The profiles and case studies in the book range from a rising star in data analytics who is in love with the intrinsic beauty of spreadsheets; the mastermind behind a brand built on absence; the “voice” of Twitter; an Argentinian couple who revolutionize shoelaces; the founder of foodie-oriented start-up Kitchensurfing that creates intimate conversation spaces; a performance artist who offers fake corporate seminars for real professionals; to an “Amish Futurist” who disrupts tech conferences. And MLOVE is featured, too. It is the quintessential business romantic gathering, isn’t it (not just because of the name)? You bring people together in the spirit of more than just business-as-usual. There is an economic incentive—yes, you might get a valuable business connection out of the conference, even win a customer or potential collaborator—but that’s not the point. Rather, business is the vehicle for building social capital. This interview was first published by MLove.